What do you understand by International Business Management? The subject which speaks about how a local business is being made global is known as International Business. In order to successfully enter the international market, all the business practices and strategies that are required are explained by International Business. 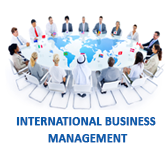 This tutorial provides a detailed insight about the concepts and strategies of International Business Management. Who are the audience for learning the concept of International Business Management? This tutorial is mainly targeted for the students who are of different streams such as Management, Human Resource, Marketing, and Business Law. What are the prerequisites required for learning the concept of Business Management? Good knowledge and understanding of the concept of business and management is essential for learning the concept of Business Management. This tutorial helps the students in understanding briefly about the International Business.